Got the twelfth part done this past week. I'm only a month behind now. Catching up ever so slowly! 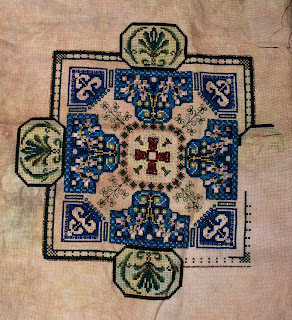 These are pretty big parts to stitch, and take quite a while, but I really like the piece. 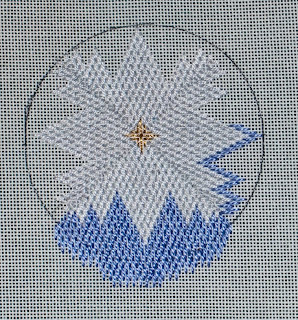 I finished this last week, and it counts as my Ornament-of-the-Month for both Cyberstitchers and Friendly Stitchers! Yes, I started it back in October, but I finished it this month, so it counts for this month. 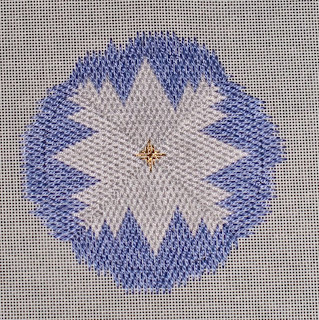 I like the way the stitching turned out, but I'm not very drawn to these colors. Perhaps at another time I'll do this again in black, white and gray. I've been wanting to get this video up all week, but we have a hard time uploading so much content over rather small bandwidth. It finally worked today! Did you know that Uruguay has the longest Carnaval in the world? It runs a full forty days here, as long as Lent. Anyway... to get on to what this is. Last Sunday, we went to the Marine House to watch a Carnaval group. We were told it was a group of performers who would be competing for the top in one of the categories. The picture was of the typical Rio de Janeiro thing - dancing girls with huge headdresses wearing barely anything. What we got were the Momosapiens, a parodista group that's all male and fantastic. Imagine, if you will two dozen plus men with regular day jobs who dance and sing as a sideline. Then imagine them dancing at a concrete poolside that they've never danced on before - with a fence six to seven feet from the pool. That's what you see here. Parodistas are one of five categories of performers who compete in Uruguay. They have a huge following, and are groups that do three things - dance, sing, and pantomine. All of it is supposed to be a comment on modern life. I hope you like watching these guys as much as I did. I'll try to put up a couple more of their videos in the next week. All were from the said party at the pool. I don't know that I really am, but it feels like I'm going faster on this side than I was on the other. Perception is everything, they say, so if I feel that way, it means I'm not getting frustrated with myself for going so slowly! The Lady's coming along, though I'm back to brown again. I also finished off the bottom of the flagpole. That's definite progress. 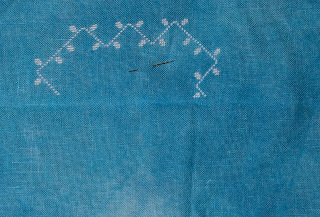 Caela Conn Tyler calls the stitch I'm using now a wave stitch. It's just nice and easy to do. 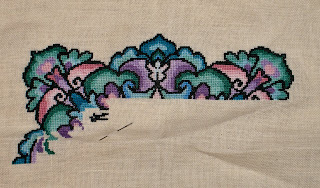 I like the way it's looking here, and it doesn't take long to get a whole needleful done. 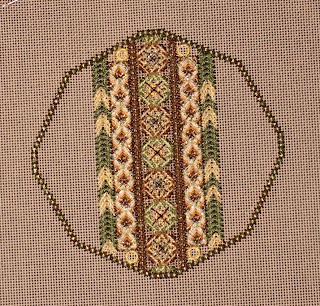 I finished up See the Stars and went on to my next Marquoir stitchalong this week - the German Group Mystery by Kelly Searles. In this picture, I'd just worked on it one day. I think I'm now rotating through things faster than they're coming out, at least! 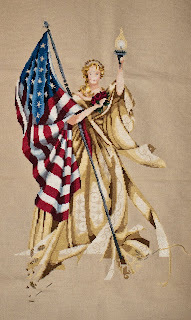 Cyberstitchers is in charge of the favors for the Share a Stitch regional meeting of the Tennessee Valley Region of EGA in June. We're making biscornus for it. This is the beginning of mine. I hope to have it done in a week or so to send to the collector. 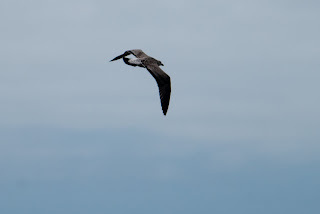 Caught an albatross in flight over the river. Those things are huge! 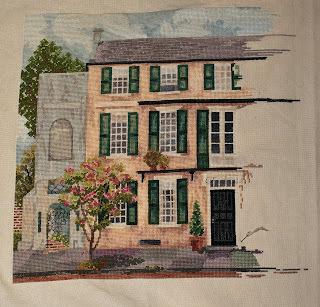 Yes, I know, there's a picture of this finished in the OWOH post. Here is where I was on it last Saturday afternoon. As you can see, I just decided it had to be finished, so I did. Now to put it into ornament form real soon. 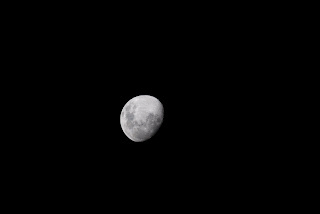 This is a picture of the moon over our back yard a few weeks ago. We have some spectacular sights here. 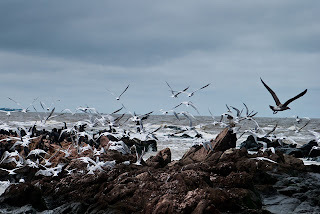 These birds were down on the rocks at the end of the street, across the Rambla. For some reason, a huge flock of several different kinds gathered there. 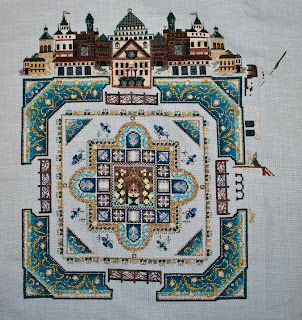 I've decided to do all the cross stitching before I go on to the specialty stitches. I might change my mind later, but this week I did some of the inner outlines. I've decided, after discovering it today, to participate in the One World, One Heart giveaway from way down here in Uruguay. Since it's a spur of the moment decision, I've not got things nicely made up for it, but they -will- be completely finished before sending to you! 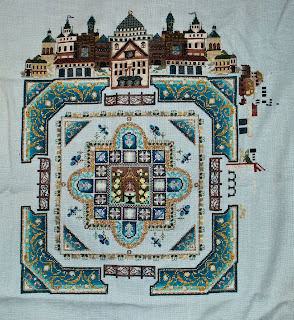 With that in mind, I'm offering three prizes: a bargello ornament that I just finished stitching today, a cross stitched ornament, and a picture from Andreas. The picture will be 8x10 inches and printed on archival paper. Each of the prizes will have more information below their pictures. To register for my drawing, just leave a comment with a way to get back to you. You -must- leave a comment before February 15th, as I will draw the winners then. This is a low resolution picture of it. It will be in much higher resolution. 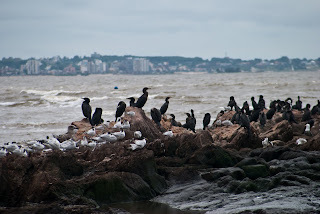 The picture was taken here in Montevideo, a few blocks from our house. There are several species of birds in it, and I think it's a neat shot. 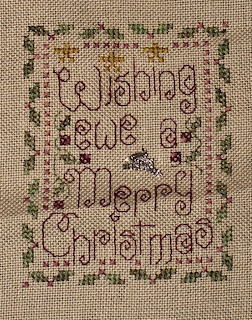 I stitched this a while back and never got around to making it into an ornament. Now you get it made into one if you win. I have the finishing materials for this; it will be going on a circular metal form. 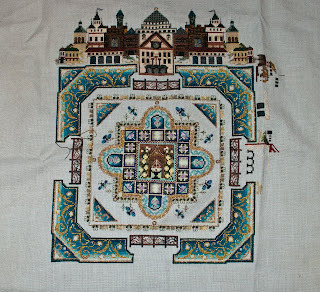 I just finished it today, and I think the bargello came out pretty well. 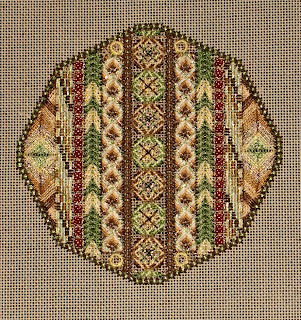 Edited 2/7/10: I added a picture of the finished bargello ornament. Now you know exactly how it will look! Remember, if you want any of these, to leave a comment on this post before February 15th. I'll be drawing a winner at nine in the morning Montevideo time on that day. I finished the Weihnachtsmysterie! 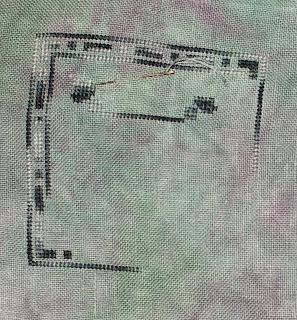 It's not getting made into anything yet because my sewing machine is broken, but all the stitching is done. 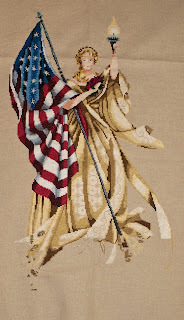 Thank you, Tam, for making this pattern available to the Marquoir group! Only work on the last egg this week, but a lot of progress on it. These pictures were taken in a field in front of the engineering school just a few blocks from the house. 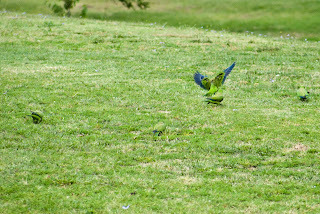 This first one is a flock of parrots. They gather in huge groups in the trees and are rather a hazard. For example, in November, when the figs in the back yard were ripe, the parrots ate all the figs or dropped them to the ground on top of the pigeons. Fun to watch, but messy and noisy. 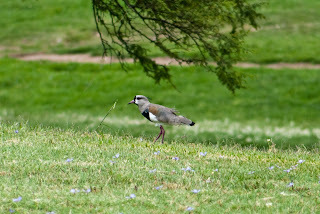 This second picture is of a tero, the national bird of Uruguay. If you notice, its legs are jointed in the same way a flamingo's are - backwards. They're pretty birds, but shy. 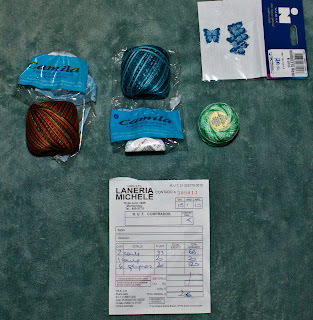 These pictures are still more stash from the mercerias I found on 18 de Julio and at the market. Yes, the pendant is the one on the necklace from the previous post. I'm still unsure whether it's a dragon or a salamander, but whichever it was, it grew this week. 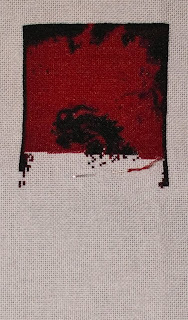 I did more black than red, and managed to get the critter done by another couple of rows. 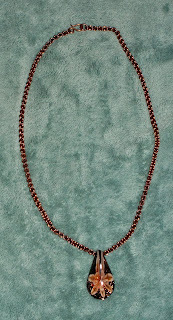 Andreas made me this necklace and found the exactly right pendant for it at the merceria at the market about a week ago. It just fits perfectly with the copper links. More work on part seven, with a couple of colors that haven't been used much so far. I'm so relieved to be done with part six that I'm working a bit more quickly on seven. The same day I got the beads posted earlier, I found several mercerias along the same street farthr down. This first picture is from one particular place that had a lot of stuff left in the back of the store, untouched for years and years. 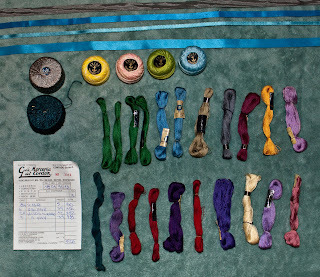 I found perle cotton, floche, and ribbon. It was fun looking through everything. The lower picture is from another merceria. I found some lovely locally made perle there too. Sincce I love variegateds, I went ahead and bought three kinds. If you look at the receipts, you'll see dollar signs. The Uruguayans use dollar signs, too. Their peso is approximately twenty to the dollar. I came to an area where I needed to add metallics this week, so I did. It was about all I did. They're the leaves/buds on the wreath at the bottom, which means I'm getting sooo close to being done. I think the change from all brown all the time did me some good, too, since I feel better about going forward with this. Three more squares done on the Kaleidoscope Mandala. 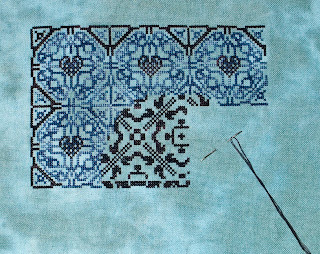 I think I'm actually beginning to make ground on it versus how many squares have been released. 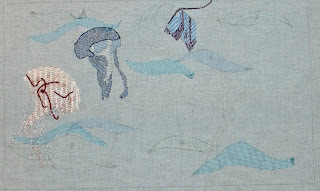 The third jellyfish is officially started, since I've decided to go in the order of the directions and not complete each jellyfish as it comes up. 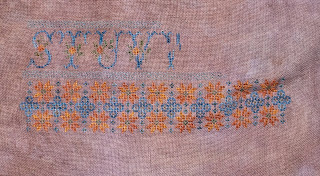 This third one has a wave stitch throughout it on the bottom. Easy enough to do, except that it is made up of one filament of silk and two of Accentuate or Bijoux, depending on color. I like the way it looks so far, though. 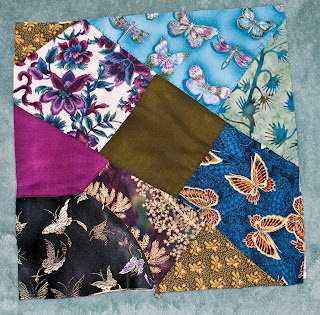 I've now completed five squares of the heart design. It looks really good in person; the colors are more subtle. After this, I started See the Stars again. 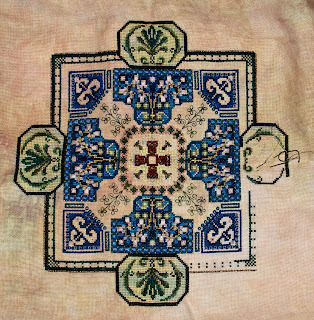 Slowly, I'm catching up on my stitchalongs. 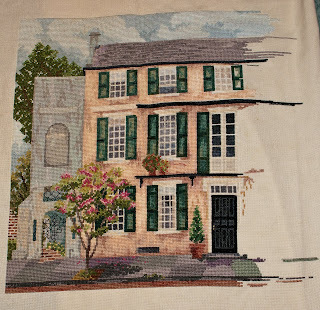 This week's work was on the upper shutter, the side of the middle window, and the gray sidewalk on the bottom. 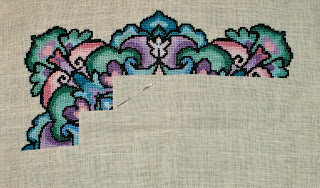 Definitely visible progress, and about to turn a page in the chart! 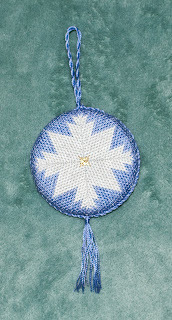 This is the second of two blocks I made for round robins this month. This one's an insect round robin, so I found butterfly fabrics to put on it. 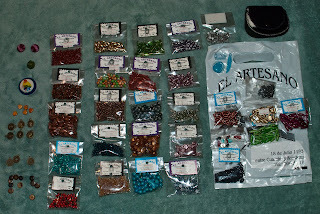 I went back to the bead shop yesterday and bought more. Some are being sent to the States for an exchange, but I'm keeping some, too. 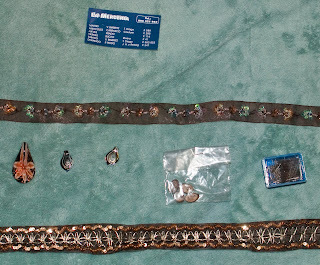 Some of the nicer finds: small coins with Elizabeth II on them, colored wooden beads, some twisted manganese blue bugle beads, and star shaped glass beads. 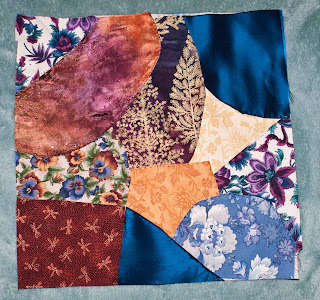 Well, I've finally joined some more crazy quilting round robins. This block is for an Asian round robin. 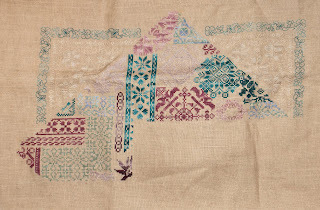 I decided to ask for an Arabian theme again, then perhaps I can do something with the two blocks - this one and the one from the previous Asian round robin. I'll have to see what they do with it! The same day I bought the magazines, we went to the yarn shop. I got alllll this! It was only about $30 US. Not bad at all. 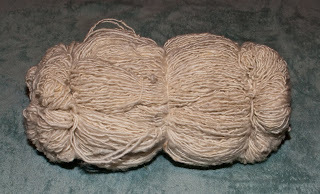 Uruguay has several yarn manufacturers, and the quality's very good. Now to start making something. 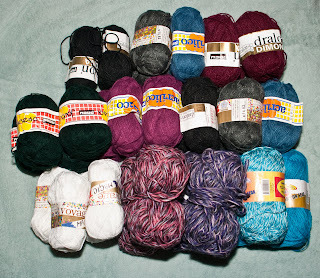 And while we were at the Port Market, we found this kilo of spun wool for about the same price. It's nice and fluffy feeling. 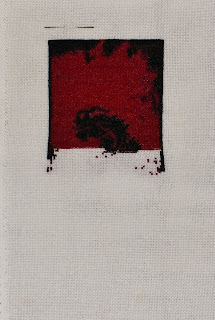 I'm going to make something and then dye and felt it. 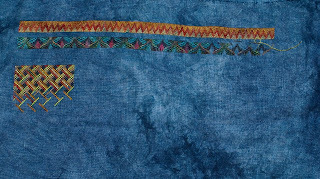 And here's the Bargello Medley from TGOSM again. 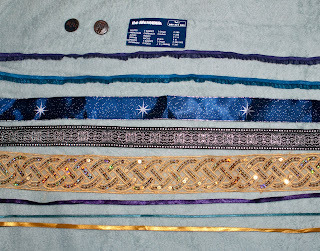 Progress, but I'm still not done with the second band. On the other hand, the first rectangle is filling in nicely. This year, I decided to join the crowd and start something new with the new year. 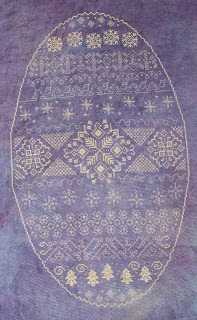 I'd bought this project, Winter White by Indigo Rose, from Stitches and Spice during the Online Retail Needlework Show. It was calling to me. So I started it on the first. My rotation's temporarily a bit larger, but I'm glad I did it. I'm close to being done with this. Only the bottom part to go, now. The end is near. Yay, real progress! I have only parts of one egg and one line to go. 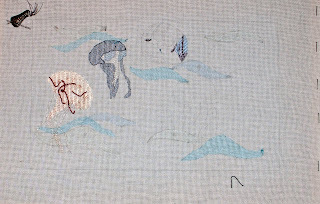 I think the line will be finished first, then I can finally go on to another part ... after I do all the specialty stitches in the lines. Last week, I got all these ribbons and buttons at the local market. It's still a bit odd to me to purchase ribbons outside, but it's neat too. She has such a selection, and I've become a regular. Not only that, she speaks English. Still get this done at a snail's pace. It's two more lines down from the last picture, at least. I got the third set of bands done now. It's filling up fast! I'm finally officially on part seven of this piece. It's only been three and a half years since I started it, and I've worked pretty steadily on it. Of course, I have a lot of other projects, but still. I'm slow. Although they look quite similar, there are differences in the four sides. The top edge of this side is definitely different from its predecessor. It's nice to have something different to look forward to on this. 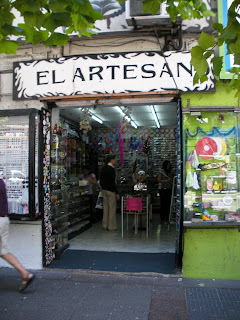 On the same trip as the bead shop, we stopped into a news stand on the Plaza Independencia. 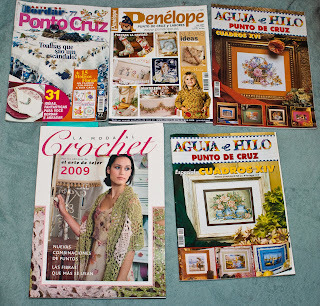 It had a -lot- of magazines, including a lot of crafts ones. All were in Spanish, but they're pretty easy to understand. I picked up these five. All have projects I want to do in them. 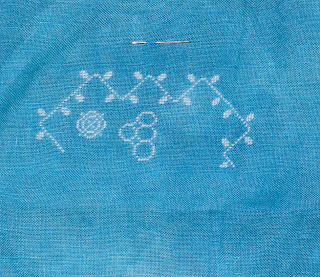 Another stitchalong in progress, since I completed the other part of the German Group Mystery. 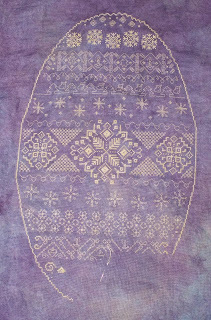 This one's the Kaleidoscope Mandala, and I've made some pretty significant progress in just a couple of days. It's taken me a while to get through the rotation this last time, so it's been almost a month since you've seen this. I did get some of a shutter done, some of the roof, and a bit of the sidewalk. A looong way to go still, but it'll get there. On Friday, we were walking along Montevideo's main drag - 18 de Julio - and came across this little hole in the wall bead shop. 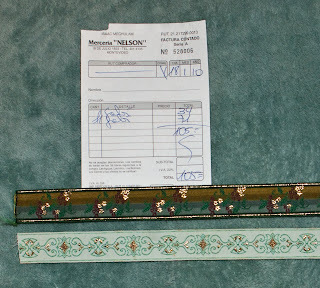 It had lots of stuff packed in, from strings of polished uneven gemstones to seed beads to novelty stuff. And this is what I bought, for under eight dollars. 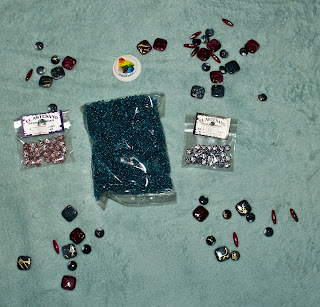 The bag of seed beads is half a kilo, and the baggies had a lot of beads in them - each of the baggies under a dollar. I'll definitely be going back when I have more time.